SayfieReview.com - Featured Column - Get Ready, Florida! It’s that time again. Historically, Labor Day has signaled the start of Floridians tuning back into politics after a long, hot summer when family vacations, the beach, and barbecues dominate hearts and minds. Many a politico—most recently Hillary Clinton—has learned that trying to grab the attention of Floridians in the summer months is way more difficult than it seems. It is true, however, that excitement has been building among Sunshine State political junkies who see 2018 shaping up to be an incredibly interesting midterm election cycle. Why the buzz? There are lots of reasons to anticipate that this non-presidential election year will be anything but typical. Here is a short list of big questions about contests and candidates, issues, mobilization efforts (registration, ads), turnout, and demographic shifts, with speculations about why conventional wisdom regarding each may be tossed aside by November 7, 2018. Will the governor’s race be nationalized to the same degree as the U.S. Senate race? Conventional wisdom: While all elections are nationalized to some degree in a president’s first term, U.S. Senate races are more so than gubernatorial contests. Conventional wisdom: A president’s low approval rating increases chances of the opposite party’s candidates winning congressional (House and Senate) races, but less so in gubernatorial elections. But in 2018? It’s speculated that the toxic nature of the Trump presidency and Florida’s deep partisan divide will make the senate and governor’s race equally nationalized. Respected national election handicappers have already labeled both races “highly competitive.” Consequently, outside money (from parties and PACs) is likely to pour into both these elections, albeit for different reasons. The U.S. Senate race is critical to whether Democrats take back control of the Senate, as it was in 2016. 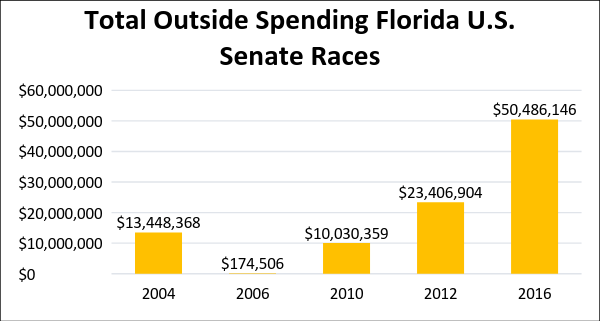 (See Figure 1 showing increased outside money in U.S. Senate elections in Florida.) Driving the current interest in Florida’s governor’s race is the fact that the next governor will play a major role in the 2022 redistricting process, especially as it affects congressional districts. Plus, Democrats are hoping to win back governorships lost over the past several election cycles, and Florida is seen as a possible pick-up. (Republicans currently control 34 of 50 governorships.) And Florida Democrats would like to improve their control of statewide offices beyond just the U.S. Senate seat currently held by Sen. Bill Nelson. Big unknowns: What will President Trump’s approval rating be in Florida by the time early voting starts? Will his approval rating affect the U.S. Senate race more than the governor’s race? How much coverage will the Florida governor’s race garner nationally? To what degree will state-centric issues (typically education, economy, environment, taxes, crime and criminal justice) “trump” Trump? In an open governor’s race (no incumbent), will highly competitive primaries with a crowded field of candidates on each side of the aisle benefit one party more than the other in the general election? Conventional wisdom: There is little consensus about whether a competitive primary makes a party’s nominee a better candidate in the general election. Some think competitive primaries are most helpful to novices or incumbents that have faced little or no opposition in recent years. Others see highly competitive primaries as damaging to whomever is nominated because they make it more di6ptfficult to rebuild party unity and replenish campaign funds. They may even tamp down turnout among key components of the base. But in 2018? As of Labor Day, neither the Democratic nor Republican gubernatorial candidate field is set in cement. At this point it is difficult to guess which party’s primary will be more contentious, although Democrats will likely outnumber Republicans battling for the party’s nomination. Currently three Democrats (Andrew Gillum, Gwen Graham, and Chris King) are in, but two others remain undecided (Philip Levine and John Morgan). A key question: Which party will unify more quickly after the primary and be more effective at turning out supporters? Historically, it has been Republicans in midterm elections. But Florida’s GOP gubernatorial primary is shaping up to be uglier and more ideologically divisive than previous contests, especially should House Speaker Richard Corcoran and Congressman Ron DeSantis enter a race currently featuring Commissioner of Agriculture Adam Putnam vs. State Sen. Jack Latvala. Can we expect 2018 to be another year of “outsiders vs. insiders”? Conventional wisdom (based on 2016 elections): Republicans are more likely to want an outsider, but Democrats a well-respected insider. But in 2018? At this point, the Republican gubernatorial field is more heavily dominated by politicians with experience at the state and federal levels, while the Democratic field features candidates with more varied backgrounds (private sector first-timer, mayor, former member of Congress). Is there the same “drain the swamp” toss-‘em-all-out mentality at the state level as at the federal level? Does that view still prevail among Florida Republicans? And what about Democrats? Thus far, progressives are calling for outsiders, convinced they can win statewide races, while others are leaning toward those with proven track records. Conventional wisdom: In highly partisan-competitive states, party-line voting in the general election is the norm and crossover voting is minimal. Recall that the last four statewide races—2010 and 2014 governor’s races and 2012 and 2016 presidential races—have all been decided by slim margins of victory. (See Figure 2.) Historically, Republicans have had more success at reuniting and turning out their voters after competitive primaries than Democrats. 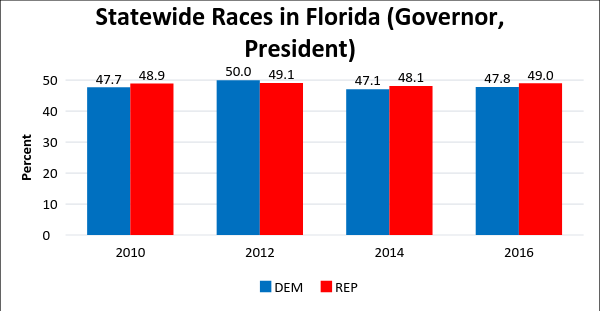 Source: Florida Division of Elections. But in 2018? Have both parties become more ideologically divided (Republicans—conservatives vs. moderates; Democrats—centrists vs. liberal-leaning progressives)? 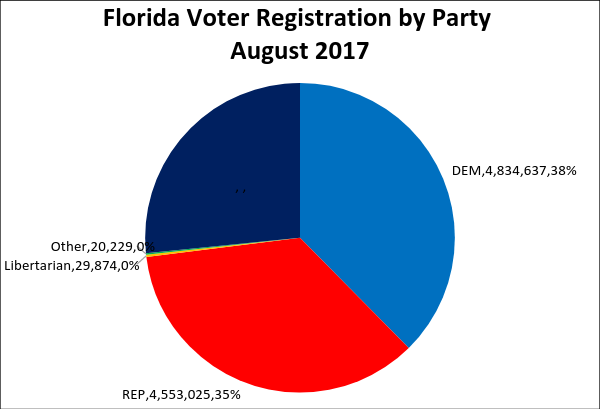 Source: Florida Division of Elections FVRS file, August 2017. Silent Generation (1928-1945); Greatest Generation (before 1928). 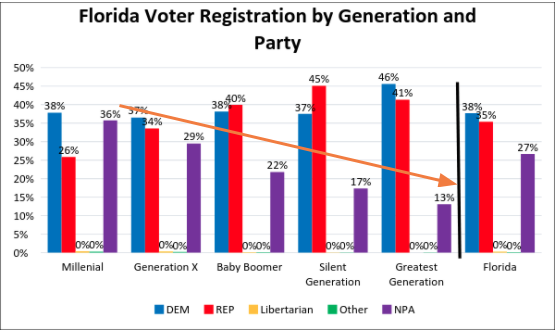 Source: U.S. Census Bureau Voting and Registration in Elections, 2014 and 2016—Florida. Source: Calculated by author from Florida Division of Elections FVRS file. Within the Democratic Party gubernatorial primary, how big a role will identity politics play? 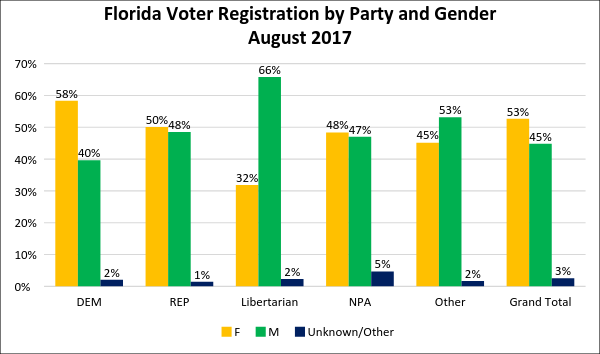 Conventional wisdom: Women and minorities are a growing share of Florida’s registered Democrats. 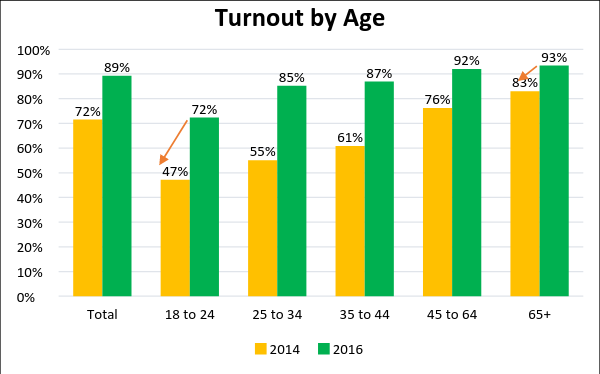 Women (all races/ethnicities) turn out to vote at higher rates than their male counterparts and older women turn out more than younger ones, especially in midterm (non-presidential) election years. Conventional wisdom: In a field with a large number of male candidates and a single female candidate, women are more likely to vote for the female. But in 2018? The Democrats who have formally announced for governor include an African-American male (Andrew Gillum), a white male (Chris King), and a white female (Gwen Graham), with two more white males (Philip Levine, John Morgan) strongly considering entering the race. Conventional wisdom would give Graham the edge based on that fact that 58% of Florida’s registered Democrats are female (Figure 7) and 55% of Florida’s female Democrats are age 50 and older (Figure 8). Recall that older women were more supportive of Hillary Clinton than younger ones. But not so fast. Many studies have shown that among minorities, race is often a stronger voting cue than gender. 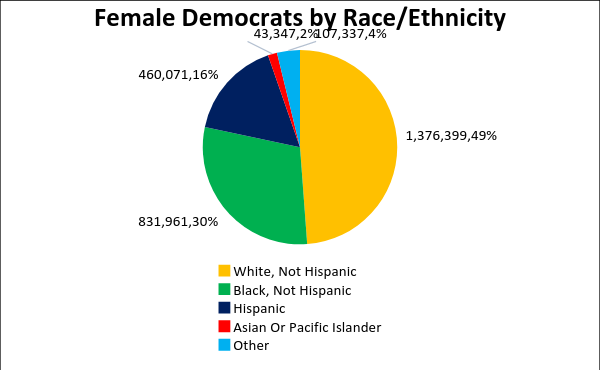 Among Florida’s female Democrats, 29% are black (Figure 9). A big question is how many will choose race (Gillum) over gender (Graham). Several influential black elected females have already endorsed Gillum. Source: Florida Division of Elections, FVRS Data File, August 2017. (1946-1964); Silent Generation (1928-1945); Greatest Generation (before 1928). Will Florida Democrats build their bench by fielding and funding more candidates for down-ballot contests? Conventional wisdom: Florida Democrats historically have emphasized and better funded top-of-the-ballot statewide races (President, U.S. Senate, Governor) over state legislative races, along with congressional and Cabinet races, thereby leaving the party with a narrow bench of experienced, competitive candidates for the top races. But in 2018? Post-2016 confabs of Democrats around the state have pledged to recruit and support more candidates for state legislative and congressional seats, and Cabinet posts. As with governorships, Democrats nationally are focused on regaining control of state legislatures (68 of 99 are currently controlled by Republicans; the GOP also holds a 3,034-to-2,317 edge among all state legislators). As with the governorship, Democrats are well aware of the major role that state legislators will play in the 2022 redistricting process. 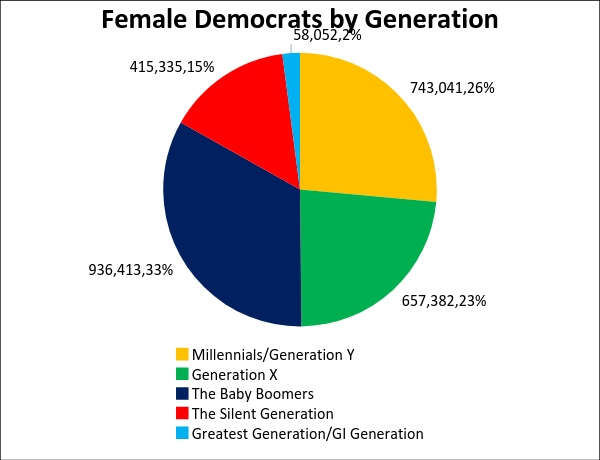 Women Democrats are seen playing a key role in the takeback. Across the country, there has been an upswing in female Democrats throwing their hats into the ring in response to the election of President Trump and his actions early in his administration. A key question: Will there be a large upswing in Democrats, especially females, running against Republicans in Florida? The filing deadline for state legislative seats is June 22, 2018. Thus far, the party is off to a slow start. For example, in races for Florida House seats, 18 non-incumbent female Democrats are running, but only five are running against Republicans (two against female Republicans). In three seats, Democratic women are running against each other (two with a Democratic incumbent, one with no Democratic incumbent). And in congressional races thus far, just one female candidate has filed to run against a Republican, although the filing deadline for congressional races is not until May 4, 2018. Will the three open Cabinet races (attorney general, chief financial officer, agriculture and consumer affairs commissioner) be highly competitive? Conventional wisdom: Historically, many competitive candidates for Cabinet posts have been legislators (often termed-out) seeing these statewide posts as possible launching pads for a gubernatorial race. But in 2018? Will some early candidates (or rumored candidates) for governor or Congress reassess and run for a Cabinet post? Or will a political unknown with deep pockets see an opening? All three Cabinet posts are open, but their statewide nature makes the races more competitive and costlier to run and win. This leaves an enormous question: To what degree can a state political party finance all the statewide races that will be on the ballot this year plus make gains in congressional and state legislative contests or fend off/promote certain proposed constitutional amendments? Could perceptions of little support result in more independently wealthy candidates willing to self-finance their campaigns? After a personality-driven 2016 presidential contest, will Florida’s voters in 2018 be motivated to vote more by a candidate’s issue/policy stances or by his/her personality and leadership traits? Conventional wisdom: Voters are more driven by policy than a candidate’s personality, especially in state and local elections. Conventional wisdom: Proposed constitutional amendments are often crafted by partisans who view them as turnout drivers. But in 2018? Increasingly, voters select a candidate because he/she is not the other one! Voting for the lesser evil is often a personality-based decision. Negative ads help cultivate lesser-evil images, and a plethora of negative ads are likely in every major race in 2018. But the bottom line is that this year’s candidate line-up thus far features a wide variety of personalities. Debates—always influential in Florida—will visually showcase these differences. At the same time, some major constitutional amendments could be placed on the ballot in 2018 by the Legislature, voters via petition, or the Constitutional Revision Commission. The Legislature has already placed several tax-relief related proposals on the ballot. Lawmakers could add more in their 2018 session. The CRC, which meets every 20 years, is currently in the process of deciding whether to put any amendments before the voters. The big question is whether the CRC (Republican-appointee dominated) will put any controversial issue-focused amendments on the ballot for voter approval (such as term limits for judges and school board members, elimination of public financing of campaigns, tax breaks, and environmental deregulation). Another worry among some is that there will be too many amendments on the ballot and it will cause long lines on Election Day (as in 2012 when the ballot had 11 amendments, some of which were lengthy). That situation was an embarrassment to the State because many voters left the polls out of frustration before voting. But in 2018, if highly controversial issues receive a lot of publicity, those issues could mobilize voters on either side of the proposed amendment and turn out voters that are lukewarm on the candidates. What will be the best way to reach voters with political ads—TV or online advertising? Are advertising dollars more important than dollars spent on the ground game? Conventional wisdom: Historically, local TV ads have been the best (quickest and most effective) way to reach voters in a large, diverse state like Florida. But in 2018? After analyzing the 2016 election and paying more attention to changing communication technology and voter media-viewing habits, a growing number of consultants are recommending spending more on online ads than TV ads in 2018. 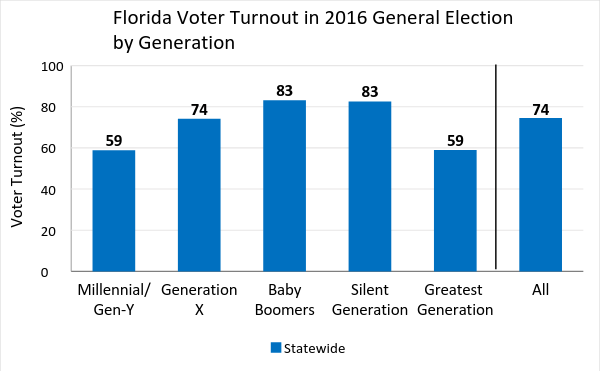 Others are still not convinced, especially because Florida’s older generations, which turn out at considerably higher rates than younger voters in midterm elections, still tune in more to local TV news programs. A bigger question is whether record-setting dollars will be spent on data-driven micro-targeted advertising buys at the expense of grassroots organization and mobilization efforts. Some Democrats believe the big-data approach cost them the 2016 election. At a minimum, campaigns must do some homework on how people in their area consume media. No longer do candidates have the luxury of one-size-fits-all communication strategies, especially with today’s sharp generational differences. Other looming questions: Can sufficient funds be raised for both major parties to cover races up and down the ballot? How much money will be enough? Each successive election cycle has seen more multi-million dollar contests. Typically, a U.S. Senate race or a governor’s race can drain contributions away from critical down-ballot contests. But the 2018 election has not only Senate and governor’s races but also three open Cabinet posts, at least five or six competitive U.S. House races, and dozens of highly contested state legislative races. Not all will be adequately funded. Are legislative races once again the most likely to be shortchanged? If so, what happens to a party’s bench-building efforts? How much change has there been in the composition of the electorate (registered voters) since the book closing for the November 2016 election? Conventional wisdom: Major registration drives do not take place in full force until an election year begins. Changes that occur before such drives begin are often driven by in-and-out migration and generational replacement. But in 2018? Both parties claim to have already started such drives. Republicans say they never stopped following the 2016 election; Democrats recently conducted Rally to Register drives across the state. Both parties have their work cut out for them. Since book closing (October 2016), the biggest registration change has been the continued increase in persons registering as NPAs. Changes in major party registration figures have been minimal, although the gap between registered Democrats and Republicans has narrowed slightly—from 2.5% in 2016 to 2.2%—reflecting Republican gains. One of the biggest questions: Will either or both parties be successful at stemming the rise of NPAs (who tend to have lower turnout rates)? Will the Democrats’ new commitment to better grassroots mobilization be successful, or will Republicans continue to narrow the partisan registration gap? In 2018, the roadmap to victory is likely to take many unanticipated twists and turns. Parties and candidates will be re-calculating mobilization strategies every step of the way. Will Floridians find the process fascinating, or experience election fatigue and just stay home? Turnout is always the hardest thing to predict, but it’s critical to winning. The 2018 election cycle presents a new challenge largely missing in the last midterm election: How to engage voters who have become convinced that politicians play loose with the facts and the media feed them partisan-biased (“fake”) news. Stay tuned for a wild ride!